It seems only right that Claud and Harold should share their profile – they were born together, served together and are commemorated together on a family gravestone at All Saints, even though they never actually lived in Wing. Claud Robert and Harold David were twins, born in mid 1890 in Greenwich to parents James Vallentine and Christina Sarah McBain. Father James was the eldest son of Robert Vallentine, farmer at Burcott Lodge Farm and formerly an academic, although rather than taking over the farm as one might expect of an older son James was sent to public school, then worked as a commercial clerk in London. Unfortunately James died unexpectedly when the twins were babies and the boys were raised by their mother and her second husband Walter Warne who was a school teacher. As a result the boys are recorded in some records as Vallentine-Warne or simply Warne. The Vallentine twins in the 1911 census. In this household, each boarder wrote their own line. In 1911 the 20-year-old twins are boarding together in Stoke Newington, Claud working as a clerk for an advertising agent and Harold for a bank. In all census records Claud is recorded first so we can surmise he was likely the first-born twin. Both boys had previously attended Merchant Taylors’ School, a public school. This school had an affiliation with the 5th (London Rifle Brigade) London Regiment which had companies billeted there in the pre-war and early war period, and it was to this regiment (a territorial regiment that required an entrance fee from its members) that both twins joined when war broke out. 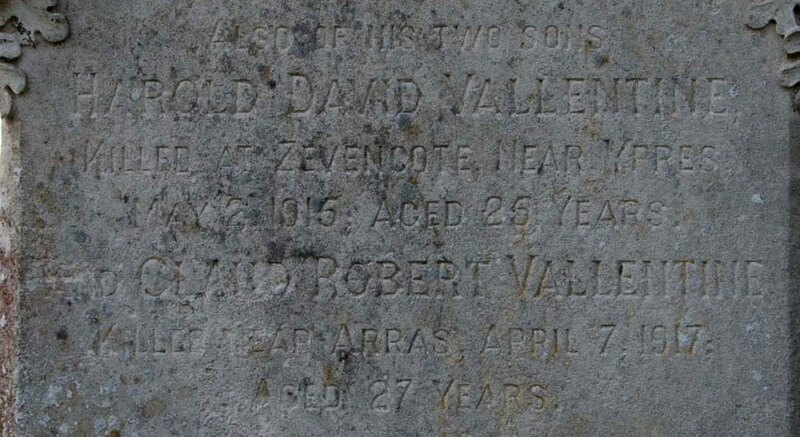 Based on their regiment numbers it would appear that they both enlisted in Finsbury in the first month or two of the war. Oddly enough their numbers are not consecutive and it appears that they did not join together. Claud’s regimental number of 148 places his enlistment in August (supported by the book Gentlemen and Officers: The Impact and Experience of War on a Territorial Regiment 1914-1918 by K.W. Mitchinson which states on page 39 that “Another two men who were to develop a firm friendship, Aubrey Smith and Claud Vallentine-Warne, were sworn in early on the first day of recruiting”), while Harold’s enlistment with regiment number 898 would have been September or early October according to army service number information found at http://armyservicenumbers.blogspot.com/2008/08/5th-city-of-london-bn-london-rifle.html. Gentlemen and Officers contains some more specific information about Claud and to a lesser extent Harold. It would appear that they were both initially in the 2/5th, however were amongst the men who volunteered to transfer to 1/5th and therefore left Haywards Heath to join existing troops of the London Rifle Brigade in Flanders, arriving on 25 January 1915. There the two riflemen would have joined the rotation in the Ploegsteert Wood region – spending three days in the trenches, three in support in London Farm, three in reserve at Ploegsteert and three in billets at Armentières. On 24 April 1915 the London Rifle Brigade entrained to join the second Battle of Ypres. 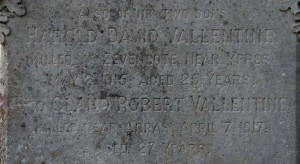 Harold’s death is recorded as killed in action on 2 May on his gravestone (which also states it occurred at Zevencote, now farmland near Zonnebeke) and Commonwealth War Graves Commission records, and 3 May on his medal card and will, but the former seems more likely given the regimental histories which state there were no casualties on the 3rd. Instead heavy casualties had come on the evening on the 2nd when German troops both shelled and gassed the battalion from the Haanebeke stream area so it seems likely that Harold was killed in this assault. Claud was not wounded. The 1/5th had some restructuring during 1915 and 1916 when they became part of the 169th Brigade of the 56th (London) Division). That year they took part in several phases of the Battles of the Somme. Claud, or Kimbo as he was known to his comrades with a new regimental number of 300282, served within the Transport section in D Company with his friend Aubrey, moving supplies around with horse and cart. His war was to end during the leadup to the First Battle of the Scarpe, part of the Battles of Arras, on 7 April 1917. The classic war memoir Four Years on the Western Front by “A Riflemen”, written by Aubrey Smith MM who was one of Claud’s closest friends in the London Rifle Brigade, gives the information that Claud and his horses Gog and Magog were blown up whilst on the road near Achicourt (note that I haven’t read this book which no doubt has further mentions of the Vallentine brothers in it). The war diary of the regiment simply records that the battalion marched to the old British trenches near Agny between 7pm and midnight on 7 April, and Claud’s last week would have spent with the battalion at Monchiet, resting, cleaning up and training (somewhat hampered by a late snowfall). Claud did not leave a will, and his estate was administered by mother Christina, his “only next-of-kin” – his total effects were £117 1s 10d. The gravestone for the twins’ father James in the graveyard at All Saints Church Wing was replaced with a more comprehensive one commemorating James, both twins, and James’s sister Catherine. It still stands today alongside the stones for the twins’ grandparents and two other aunts. Harold’s name is recorded on the Ypres (Menin Gate) Memorial, and Claud has a military gravestone in the Agny Military Cemetery which also mentions Harold. Claud’s name can also be found on the WWI memorial in Richmond, Surrey (as Claude Warne) however it is possible this has been misattributed to our Claud as Harold does not appear. The twins were included in the reading of the Roll of Honour at the Tower of London on 2 November 2014.